I am so not into “franchise” novels, novels that are written-to-order, set in the universe of an established franchise like Star Trek. Like franchise computer games, franchise novels tend to be hollow, weak, transparent attempts to capitalize from the success of the original work. I like Star Trek. Over the years, I did read the occasional Star Trek “franchise” story, but they did not leave much of an impression. So I was not particualrly motivated to read another. That said, when I recently read about Provenance of Shadows by David R. George III, a franchise novel written to coincide with the 40th anniversary of the series, for reasons I can no longer recall I became sufficiently intrigued to read the sample chapters on Google Books. They were enough to get me to buy the book. I do not regret doing so. This book tells the story of an alternate timeline. 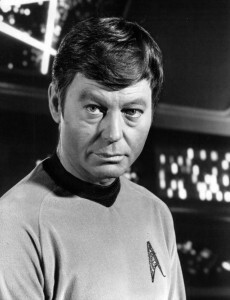 Namely, the alternate timeline created by the events in the famous Star Trek episode “The City at the Edge of Forever”, in which Dr. McCoy finds himself in 1930 and, as we later learn, by preventing the death of a social worker, gravely alters history. The social worker, Edith Keeler, is a devoted pacifist; in the alternate timeline, she launches a pacifist movement that becomes powerful enough to delay the entry of the United States into World War II. This gives Hitler a chance to achieve victory on the Eastern Front, Japan a chance to conquer much of the South Pacific including New Zealand and parts of Australia, and most alarmingly, gives the Nazi atomic bomb project a head start. I find this “alternate history” timeline compellingly believable. We tend to think that the defeat of the Nazis was a historical inevitability but it was by no means preordained. Suppose the United States adopts a different posture in the Pacific in the late 1930s and early 1940s, so that Japan has easier access to raw materials and oil, and feels less threatened by the US Navy. Suppose this convinces Japan that defeating the US is not a priority. No Pearl Harbor in 1941 means no opportunity for Stalin to move a huge, well-equipped and experienced winter fighting force from Siberia to Moscow, and the first successful Soviet counteroffensive never happens. There is a good chance, then, that Hitler would have captured Moscow in early 1942 and after that, Stalin’s government may have collapsed. With the resources of the Soviet Union secured, Hitler would have finished “pacifying” Western Europe, including Great Britain. Had this happened, the world in which we live would be a very different place today. McCoy’s struggles to avoid altering history and later, to understand how he altered history, and his struggles to come to term with his own demons both in this alternate history and also, back in the 23rd century in the original timeline, make this book a compelling read. I enjoyed it thoroughly.